Description: 14" DB Tom Tom Drum signed by Bad Company in green and blue sharpie pen. Personalized to Mike. Note: Item signed backstage while on Bad Company's 1995 US tour at the Starplex Amphitheater in Dallas, TX. 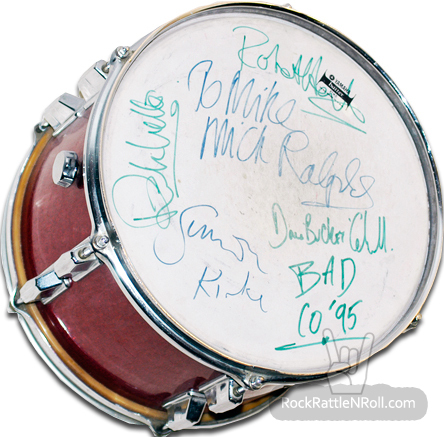 Signed by: Mick Ralph, Simon Kirke, Rick Wills, Dave "Bucket" Colwell and Robert Hart. 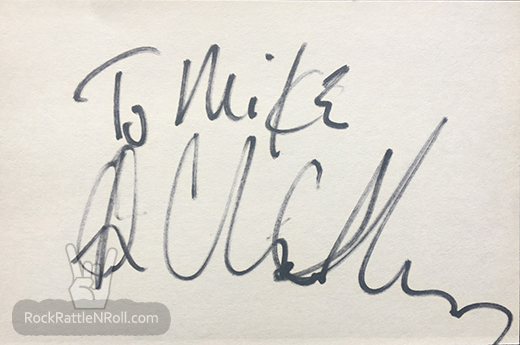 Description: Bad Company Mick Ralphs Autographed 4x6 Paper. Signed by Mick Ralphs in black sharpie pen. 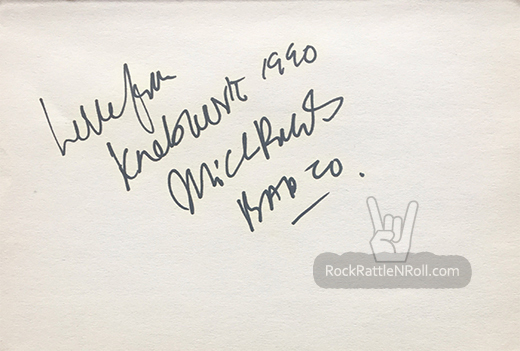 Note: Item signed backstage at the 1990 Knebworth Concert in the UK. Description: Bee Gees Size Isn't Everything LP Promo Poster. Size 24x24. Note: Item signed at the Sony office in Dallas, TX. Signed by: Barry Gibb, Robin Gibb and Maurice Gibb. Description: Limited Edition Pop-Up CD signed by Billy Idol in blue sharpie pen. 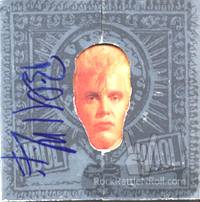 Note: Item signed on Billy Idol's 1990 US tour at the Crescent Hotel in Dallas, TX. 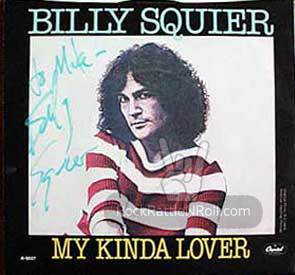 Description: My Kinda Lover 45 picture sleeve signed by Billy Squire in blue paint pen. Personalized to Mike. 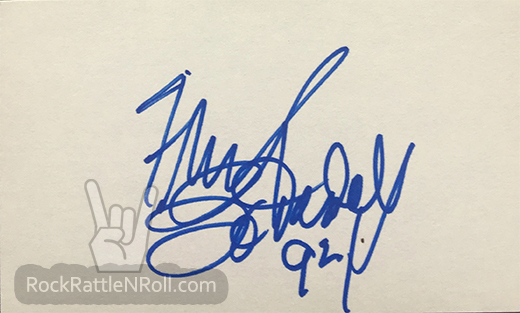 Note: Item signed on Billy Squire's 1989 US tour at Deep Ellum Live in Dallas, TX. 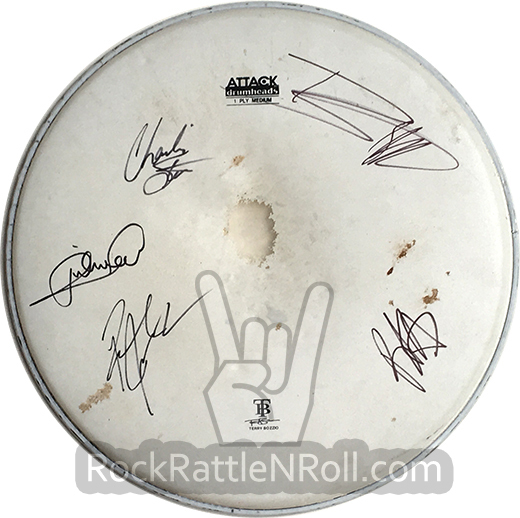 Description: Blackberry Smoke Attack 20" Drumhead Complete Band Signed in black sharpie pen. 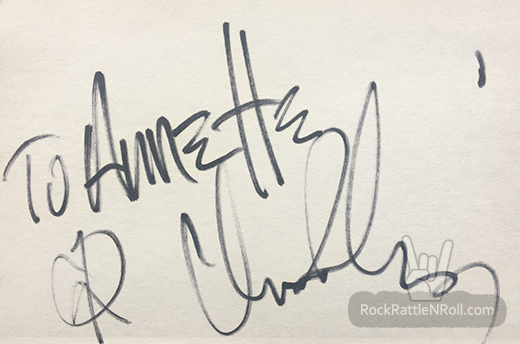 Note: Item signed while on their 2015 US Tour at the House of Blues in Dallas, TX. Description: Black Crowes Chris Robinson Signed 4x3 Card Signed by Chris Robinson in black sharpie pen. Personalized to Mike. Note: Item signed at Q102 Radio Station in 1998 on a solo promotion stop in Dallas, TX. Description: Black Crowes Chris Robinson Signed 4x3 Card Signed by Chris Robinson in black sharpie pen. Personalized to Annette. 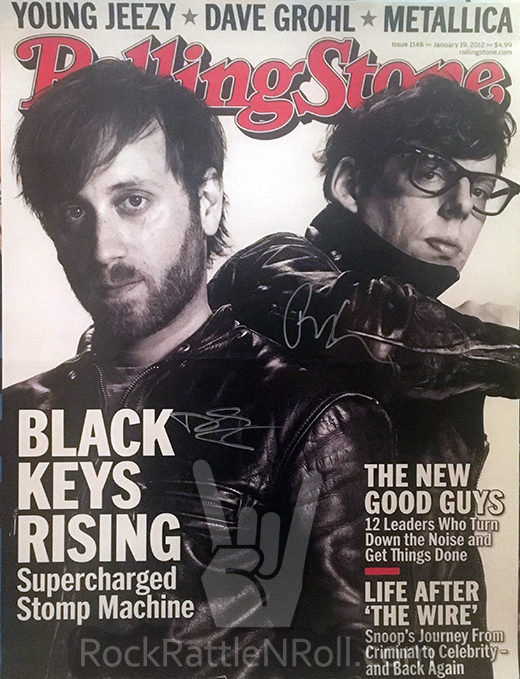 Description: Black Keys Autographed Rolling Stones Magazine Cover Promo Poster. Note: Item signed while on the Black Keys 2012 US tour backstage at Verizon Theatre in Dallas, TX. Description: Bo Diddly 4x3 Index Card. Signed by Bo Diddly in blue sharpie pen. Note: Item signed while on his 1992 US Tour backstage at Deep Ellum Live in Dallas, TX. 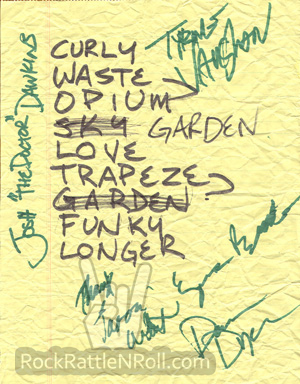 Description: 8.5x11 Note Paper Set list signed by Breedlove in green sharpie pen. Note: Item signed backstage while on their 1995 US tour at Caravan of Dreams in Ft. Worth, TX. Signed by: Tyrone Vaughan, Dan Dyer, Josh Dawkins, Jason White and Ezra Reynolds.